The birds are enjoying their new found freedom since the hoop house went down; scratching for bugs and worms. They eat less grain now that they are foraging in the garden. 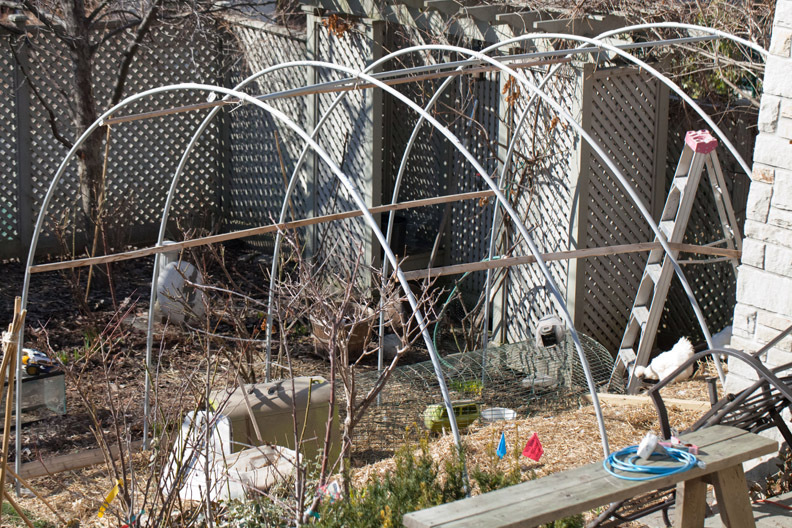 Hoop house being dismantled – the ground is rich after all the “fertilizing” the girls did this winter. The claws on a chicken are quite powerful as they scratch around. Poor spring flowers! Time for restricted access. preferring to lay her eggs in the garage. I haven’t the heart to clip her wings. Jenny is so funny, she always comes running to greet me. 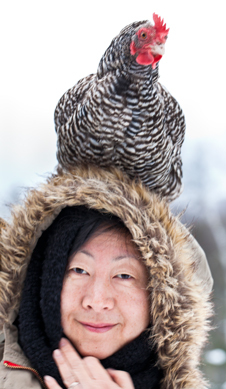 Who needs a dog when you’ve got a chicken. Who needs a rooster when you’ve got a dog? 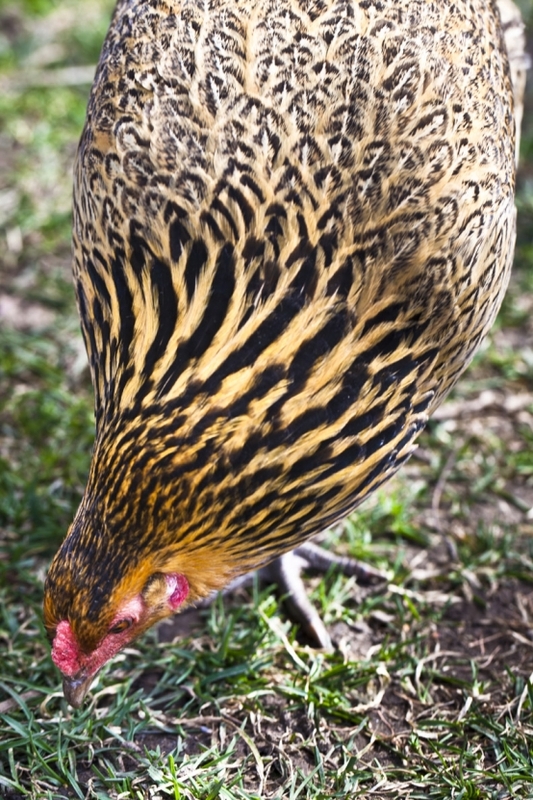 The ladies respect Betty as their rooster because she routinely patrols the perimeter for predators like cats (and squirrels). And she’s right in there when it’s treat time. Ava takes a bath while Sunshine tries to steal her spot. Amazing how a white bird can stay white, bathing in dirt. Where it all begins…I should have started these vegetables a month ago. All the bonsai trees that wintered in the greenhouse seem to have survived. This is a Larch tree, one of the few conifers that drop its needles in the fall. Here, you can see the buds of tiny new needles ready to burst with the next warm day. An Elm & Pine tree — both these trees I’m guessing are about 80 years old, maybe even older. The strawberry plants miraculously survived, in a few inches of clay pebbles, in our unheated greenhouse, and already has flowers. A new crop of goldfish for the aquaponics tank. This year we’ve sunk the tank into the ground to keep it cooler in summer and warmer in winter. We lost a few fish last summer to extreme heat, and the rest this winter to freezing temperatures. Jenny keeps pecking at the fish, hoping for a treat. I swear she’s half chimp, the noises she makes and her endless curiosity is very monkey-like.